Donna and I spent about 2 weeks on New Zealand’s gorgeous South Island. We drove nearly 3,000 kilometers but afterward still felt that somehow we had only scratched the surface of what one Kiwi I met called God’s Country because of its extreme beauty! The key decision point for us after arriving on the ferry to Picton late on Monday afternoon was which way to drive south to Queenstown: along the west coast or along east coast. We ended up taking the eastern coast route mainly because it meant we’d be partaking in more wine tasting the following day. This also would mean that when the time came to head north back to Picton in order to catch the ferry back to the North Island, we’d take the western route, which was said to be a more grandiose drive as the Southern Alps rise starkly from the Tasman Sea and the cliffside roadway looks akin to Big Sur — saving the best for last! Really, either way would’ve been awesome and most of all we were stoked to start exploring the South Island. The town of Blenheim is only 30 minutes south of Picton in the heart of Marlborough wine country, a region that produces most of New Zealand’s finest Sauvignon Blanc wines. Donna was very excited to check out the winery of her favorite white wine, Cloudy Bay, so that was the top of our “to do” list. Meanwhile, I went on the hunt for some mountain biking trails. There was no disappointment for either of us! Right near the town center we found an inexpensive hostel that we stayed at for two nights and that afforded us beds to sleep in and a large kitchen to make a few meals. Next door to the hostel was a bike rental shop, where I learned that Blenheim, like any respectable New Zealand town, had a mountain bike park. The following day was a the real-deal wine tasting experience. We started off with the main event: a tasting at Cloudy Bay, where we also came away with a good compliment of whites to take back to America with us for holiday sharing purposes. After that we headed to Sherwood Estate, but the tasting room was closed for renovations, although there was a consolation prize: an open cheese tasting room. We walked away with several cheeses, including an incredible aged bleu and a musty cheddar. Next up was a taste of some incredible sparkling wines at No1 Family Estate followed by a visit to the Moa Brewery, where I tasted some great beers and walked away with a few hard to find IPAs. We lunched at the posh Allan Scott vineyard and received a free tasting with meal. Finally — and at this point I was feeling a little buzzed — we headed to the first and largest of the Marlborough vineyards, Bancroft Estate, where we enjoyed a scenic overlook of the Marlborough valley and tasted a few more kinds of sauvignon blanc. What a day in the vineyards! The bike park in Blenheim. Better than expected and nobody else there! Donna riding at the top of the Blenheim Mountain Bike Park. She has arrived at the winery of her most favorite Sauvignon Blanc! Barrels and barrels of white wine. This years vintage of Cloudy Bay sparkling wine. I bought these two beers and enjoyed them in the van on separate evenings. One is a double IPA and the other is a white IPA. Can you tell I like hops? The view from the top of the Bancroft Estate winery was awesome. We could see the mountain bike park and acres upon acres of vineyards. With Donna behind the wheel late that afternoon, we drove south without a clear destination in mind. After a few hours we made it to Kaikoura and along the way we were treated to a gorgeous coastline that in many places was a brilliant aqua color and groomed by light offshore winds. We passed many surf spots along the way, but there was absolutely no swell in the water, it was Lake Pacific. Kaikoura was a sleepy beachside town and thus fish-n’-chips was our call for dinner and it was a delicious experience. During the meal we discussed where we wanted to end up that evening and after some Google-ing we decided that a small town called Hanmer Springs would be worth checking out the next day, where we could do some mountain biking in the forests surrounding the town and then afterward soak our bones in the hot spring park. The drive was long and we took an inland scenic route that afforded great vistas as the sun was setting. I snapped a few pics of cute lambs too and by just after 9pm we made it to our campervan park and relaxed. In Hanmer Springs the next morning we rented bikes and contemplated which trails we’d want to find and ride. The mountain bike shop offered a package that included a van ride to the top of the mountain behind town and then you’d get to ride back down to Hamner; it seemed like a great ride but was way overpriced, so we decided we’d just ride up and down ourselves! A gruelling 8km climb of over 2,000 feet on a dirt road brought us to the high country behind the Hamner Range where we followed a road along the Clarence River until we forked off to descend back into Hamner. The trail ride down on yet another logging road was not that awesome; Donna and I had clearly been spoiled by the awesome tracks at places like Rotorua, but it was a long ride with fantastic views of the Hanmer Valley. Overall the ride took us just over 4 hours. Oh, and then the hot springs awaited us and they were fantastically refreshing and relaxing. I even snuck a ride on the waterslide! We spent the rest of the afternoon continuing south and we freedom camped at a random site along the road. It was a quiet place by a river, but both Donna and I got a little eaten by mosquitos in the short time we spent outside. Amazingly, this was our first and only encounter with man-eating insects in New Zealand; they are usually not something to be concerned about. We completed the final leg of our drive to Queenstown that Friday. We passed through more epic scenery and even passed through the pasture land where our favorite merino wool clothing, Icebreaker, comes from. We took a break from driving at the head of Lake Tekapo and made some reservations for adventures in Queenstown: rafting, mountain biking, and ATV riding. One trick we learned was to check www.bookme.co.nz for discounted activites; we saved a couple hundred bucks by doing this for rafting and ATV riding. By the time we made it to Queenstown it was dusk and after a brief foray in town it started raining so we drove to a campground about 10km south of the town. We’d been tracking the weather closely and it looked like it’d be tricky partaking in the activities we wanted to do for the next week given a few systems forecasted to be moving through, but we were optimistic for periods of favorable conditions. Looking north from Kaikoura. The Pacific was flat as a pancake and an amazing blue color. This was early on in the 8km ride to the top of the Hanmer Range. Much father along and about 1,000 feet higher in the big climb. Stopping for lunch at the top. On the way down. It was a boring fireroad down. Relaxing at the hot spring waterpark. At the campervan park south of Queenstown it rained most of the night. It wasn’t raining when we drove back into town to the rafting guide meeting spot, but we were informed that because of the torrential downpour the previous night, the Shotover River was too high and therefore it was unsafe to raft that day. The normal flow for the Shotover River is about 20-30 cubic meters per second (m/s), the max flow they will still allow rafting on is about 75 cubic m/s but because of the rain the previous day the river was flowing nearly 150 cubic m/s! We had to come up with a new plan so we hung out at one of the adventure planning stores and the friendly guides helped us figure out a plan. We had heard that checking out the Doubtful Sound in Fjordland was a worthwhile trip, but the availability for trips to Doubtful was non-existent, so instead we booked a sea kayaking trip for the following morning in Milford Sound. Even though Milford Sound is only about 50 miles away from Queenstown as the crow flies, to get there via car one must instead drive all the way around Lake Wakatipu to the town of Te Anau and then follow Lake Te Anau north into Fjordland, through the epic Homer Tunnel and then down into Milford Sound. We left immediately and the entire journey took well over 4 hours, but it included spectacular scenery as we weaved through glacier carved fjord valleys. We made frequent stops along the way to take photos and gasp at insanely high waterfalls gushing from all aspects of rock; the recent rain ensured all waterfalls were gushing near their fullest. At one stop we also encountered a number of rather tame kea birds. I commented to Donna after first seeing one that it looked kind of like a parrot and it turns out that these highly intelligent birds are the world’s only alpine parrot. By the time we made it to Milford Sound it was dusk and we were lucky to secure the last two bunk spots at the Milford Lodge. After getting settled we went on a jogging tour of Milford Sound; the area was so small that we basically checked everything out, from the airport to the docks to the expansive wetland park, within about an hour of running around. It felt great to stretch the legs after being in the campervan for so many hours over the previous two days! Sea kayaking the next day was an awesome experience and the weather was perfect. We woke early and were on the water by 8am. Being on the water early was worthwhile because early it was completely glassy and later on during the trip a seabreeze kicked up that made the kayaking much trickier. I brought my GoPro and snapped a bunch of pics of the tranquil setting. Highlights included kayaking through “tree barrels” that hung over the water and seeing 2 penguins walking around that were nesting in the sound for the winter. I’d recommend the trip we did with Roscoes Sea Kayaks to anyone visiting Milford Sound. Due to the copious rain the previous night, the fjord walls were teeming with waterfalls. Geared up for some sea kayaking! Amazing backdrop for sea kayaking in the Sound. Planes would buzz around ahead, which would’ve been an awesome but expensive way to see the glaciers and scenery. Our kayak! Guess who did most of the real paddle work…? If you look closely you will spot a penguin! On our way back I snapped this photo just before entering Homer Tunnel. We drove back to Queenstown and this time took up residence in a private room at a hostel called The Southern Laughter that is very close to the main drag. We ended up spending 3 nights in a row here and it was worth it to relax in relative luxury and be able to cook meals in the kitchen. The next day was an epic one with fantastic blue skies. In the morning we went rafting on the Shotover River. The river flow had fallen to about 50 cubic m/s and the rapids were super fun. The drive in was also very interesting and sketchy as it was a old gold mining road that was narrow and wound down along steep cliffs lacking any kind of safety guardrails. The road was used during the big gold rush in the 1800s by thousands of prospectors seeking fortune. Apparently the stretch of the Shotover River we were about to float down had produced more gold than just about any river in the world and our guide told us that even to this day some of his friends had found small gold nuggets while panning for gold! The highlight of the rafting trip was a tunnel we floated through that ended in the biggest rapid of the day. The tunnel was created by gold miners who sought to divert the entire river so they could easily get gold from the riverbed, but they miscalculated so only half the river was diverted. At least their efforts now provide tourists like us with a novel experience! That afternoon we went 4-wheeling in the hills overlooking Queenstown. Donna was tickle-pink with excitement, as she always is whenever we do any type of motorsport like jet-skiing or ATVing, and she raced along the hills with a huge smile on her face the entire time. The guide was impressed with our riding skills and took us along some more advanced tracks, where we got to speed through huge mud puddles that splashed up enormous amounts of dirty water. The bigger the splashes we made, the more the guide was impressed. The vistas included the spectacular range of The Incredibles, which the guide informed us was the inspiration behind the Coors Beer logo; I kind of saw what he was saying but also felt like this was a classic Kiwi joke to tell Americans. The next day we had scheduled a mountain biking excursion at Rabbit Ridge, which was in the Gibbston Valley near Queenstown. We had a lot of fun biking the deserted park. We paid for a package that included 5 rides up to the top of the park in a van, which minimized the amount we need to pedal uphill. The trails were rather technical with lots of banked berms on steep terrain and it was good practice for improving our riding. At one point I totally slipped out and ate crap, my first real fall of the entire trip, but luckily I rolled it out and avoided any injury beyond a few minor scrapes. The guide also got a fantastic photo of Donna coming around a berm that I am guessing may be in their next brochure or something. After the ride we stopped by the Gibbston Valley Winery for a tasting of their Pinot Noirs, but we didn’t really like their wines all that much, the first time I’d actually been disappointed by New Zealand wine during the entire trip. Back in Queenstown by early afternoon, the rain started to come down. We fuelled up at the infamous Fergburger. Anyone who has visited Queenstown has probably checked out Fergburger and I can attest that the taste of the burger really does live up to the hype: it is super good and by far the best burger in town. There is also always a line out the door so expect a wait! We spent the rainy afternoon playing Blackjack at the local casino and after over 2 hours of play we wound up making about $25, which felt like a great outcome. During some of the gaps in our time I managed to get 2 rounds of frisbee golf in. There is an 18-hole course in Queenstown that was pretty good, weaving through a forest and with a few “ace holes” and I was stoked to get to toss a few rounds. Donna played with me during the first round and she definitely has a natural talent for throwing discs, although I wonder if I’ll ever get her to become passionate about the sport like I am, haha. The next day was Wednesday, November 26th. We’d been in the South Island for well over a week at this point and we knew we need to start making our back north before too long, but there was still one more major adventure to be had in Queenstown. When we arrived, I challenged Donna that if she wanted to try either bungy jumping or skydiving I’d happily pay for it, my thinking being that given her inability to jump off a 20 foot high rock into the sea back in Cabo a few years back, that the likelihood of her wanted to do either of those former activities was pretty low. But I wanted to encourage her risk taking side and I was stoked when we woke up that morning and she said she wanted to go bungy jumping! In the Queenstown area there are several bungy jumps to do, but my philosophy is “go big or go home”, so there was no doubt in my mind that we’d have to do the Nevis Bungy, which at 134m is one of the top 10 highest in the world. There was nervous excitement for both of us as the time for our jumps approached but in the end we both charged out there for the most thrilling 10 seconds of our entire trip. The photos and videos speak for themselves! Someplace in town I found this statue of a Moa. These were the huge, flightless birds that lived on New Zealand until they were eaten to extinction by Maori’s in the 1300s. At over 10 feet tall it would’ve been incredible to see a living one! This is the infamous Fergburger, complete with an insane line out the door. It’s worth the wait! Only in New Zealand: a jet-ski powered, drivable shark. At the Queenstown frisbee golf course, the teepad for hole #2 is off this big rock; very unique. Donna passed the “intro to quad biking” part of the course with flying collars. The range in this photo is called The Incredibles, which our guide claimed was the inspiration for the Coors logo. At the top of the scenic overlook for Queenstown. Normally this hike would take 2 hours, but we zipped up in about 20 minutes. The bigger the mud spray we created, the more stoked our guide was on us. Donna cruising along the track. At Rabbit Ridge mountain bike park we found this very aptly named trail, which we rode a number of times. Tasting wines at Gibbston Valley Winery. We did not find these wines especially good, strangely enough. Of course we rode the gondola to the viewpoint overlooking Queenstown. That jacket I’m wearing we bought for $180 in Wellington; it’s 2-layer Gore-Tex and completely waterproof; it was a good deal. Our first view of the pod we’d be jumping from. My turn next. I got my GoPro ready. Strapped in and ready to go. Can we get on with this already? This just doesn’t look natural! I give it a 9 / 10. Perfect score if I didn’t look so scared. They reeled me all the way back up like a fish because I failed to pull the pin that would’ve enabled me to be brought up in a seated position. Bungy jumping and living to tell about it makes you STOKED ! Nervous excitement written all over that face. Make sure to double check that rope, please. A split second before her leap! This gives some perspective about just how high up we were. 134m is a long way to fall! We had heard from multiple people that Wanaka was their favorite town and definitely worth checking out, so after the buzz from bungy jumping wore off, plus another round of Fergburgers, we made our way to Wanaka. We arrived late in the afternoon and found a campervan site using the ever convenient NZ Campervan app. The next morning we went and played the Wanaka golf golf course in Lisborn , which was brand new and I had learned about from a posting I found at the start of the Queenstown disc golf course. The course was rather boring as it mostly covered treeless, hilly terrain, but it was kind of fun for its simplicity and I took down a solid 3-under par. Afterward I rented a mountain bike in order to check out the Wanaka’s Sticky Forest mountain bike trail network. Donna wasn’t feeling well, so she opted to stay in town and work on a blog post while I checked rode. Overall I was impressed with the trails and spent a solid 3 hours exploring Sticky Forest. There was some very advanced riding to be had and I found two runs that had awesome medium sized jumps that gave me a good thrill. I came back thoroughly exhausted, but our plan was to start driving north so we left Wanaka after I returned the bike. Panoramic I took from a good vantage point in the mountain bike park. You can see Mount Aspiring National park in the background on the left side. Based on conversations we’d had with a number of people while in Queenstown, we decided we wanted to check out Able Tasman National Park, which was way up on the northwest tip of the South Island. This meant we needed to really get moving and drive well over 1,000kms from Wanaka along the west coast in order to get to the park and still make our ferry ride back to the North Island. We wouldn’t have much time to do any real sight-seeing, but we hoped the views from the road would be as spectacular as people had said. From Wanaka we ended up making it to about 30 miles south of the Fox Glacier before we ran out of light and found a campervan park to spend the night in. The next morning we decided to check out the Fox Glacier, which was a short drive off the main road and then about a 30-minute hike to an overlook where the glacier terminated in a spiky mess of calving ice. I think this was my first time seeing a glacier like this and it was impressive, and even more so when one considered that the entire huge valley we were in was carved by the slow moving ice. The Glacier has been retreating quicker every decade since measurements had begun in the mid 1800s; in general the world’s glaciers seem to be humanity’s most stark reminder that climate change is happening. From the Fox Glacier we pretty much bee-lined straight up to Able Tasman in an epic 8 hour drive. The weather was somewhat cloudy and gloomy for most of the ride, which is actually fairly common for the area given the west side of the South Island consistently receives more rainfall that just about anyplace in the world. We did stop for dinner in a small town called Murchison where I had one of those classic “it’s a small world” moments when I saw two lady kayak guides at the restaurant we had just walked into. I was curious about what kind of rafting was in the area so I struck up a conversation and it turned out that these two girls knew a friend of mine from the U.K., Sara James, who had come through New Zealand a year and a half prior for a few months of kayaking. I sent the picture I took with Sophia and Meg to Sara and she was stoked! Once at Able Tasman we stayed in campervan park right on the beach and got a good nights rest in preparation for the long hike we planned to do the next day. Me and the two kayak guides and friends of Sara that I met in Murchison. Sophia and Meg. The Able Tasman National Park contains another one of New Zealand’s “Great Treks”. The park butts up against the Tasman Bay and is known for gorgeous white, sandy beaches and aqua blue water. The hiking trail runs along the coast from the hamlet of Marahau in the south to about Wainui Bay in the north with a total length of about 50 kilometers that would take 2 or 3 days to hike in its entirety. The following day we needed to catch the early ferry from Picton to the North Island, so we’d only be able to complete one stretch of the trail, but this wasn’t a problem because water taxis run to ferry people to and from pretty much any point along the trail where they need to go. So we signed up to be dropped off near Bark Bay and planned to hike about 20 kilometers back to Marahau. Compared to the gruelling Tangiriro Alpine Crossing, hiking in Able Tasman was a pleasant walk in the park. The views were gorgeous and the beaches amazing and we were able to shave off 5 kilometers of the hike by taking a shortcut afforded us due to an unusually low tide. Along the trail about every 100 meters or so we would see an animal trap designed to catch sloats or possums; these invasive species would devastate the indigenous bird’s nest’s and so conservation groups in New Zealand work tirelessly to try to remove the predators in order to induce the native birds to return o the mainland bush from the coastal islands where they only live now. After the hike Donna enjoyed a glass of cider and myself a refreshing beer. We were actually fairly tired after the hike, I guess we were working harder than we realized as Donna set a furiously fast pace. 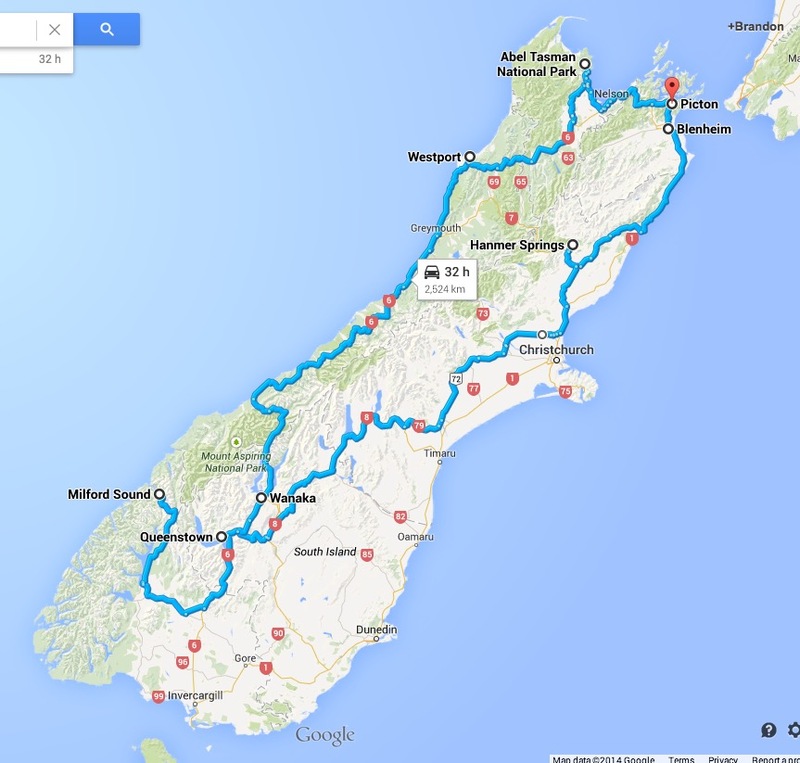 We drove towards Picton and stayed one last night at a campervan site on the way. The next morning we quickly made it to Picton and onto the ferry back to the North Island. We boarded the water taxi on land and then this tractor dragged the boat to the sea. Getting to shore from the water taxi involved getting one’s feet wet. Donna on a rickety bridge. We ate lunch with this as our view. You don’t wanna F with this guy! On our drive from Able Tasman to Picton, we came across this huge lumber yard. All those invasive trees they cut down have to go somewhere! And with that our New Zealand adventure quickly came to a close. Back on the North Island I was stoked to get at least one surf session in before we caught a plane back to SF. WE WILL BE BACK TO NEW ZEALAND, IT IS THE MOST AMAZING COUNTRY WE’VE BEEN TO. EVERYONE SHOULD CHECK IT OUT FOR THEMSELVES !!! And we hope that by reading our blog posts about New Zealand, you can learn from our experience and craft your own epic adventure!